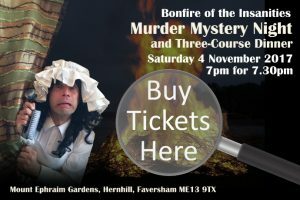 If you live locally to Faversham – and can pay for and pick up your own tickets from an address in Faversham before the event – you will save yourself the transaction fee. Important: Tickets must be paid for and collected in advance – tickets cannot be held for you at the door on the night. If you are unsure if you will be able to pick up your tickets from Faversham then please use our online ticketing system. 2. We will contact you to let you know when and where your tickets are available for collection, and they will be allocated on a first come, first served basis.